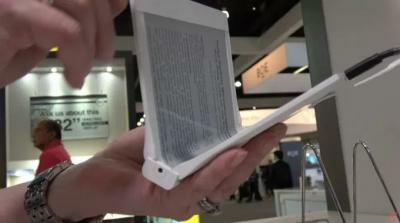 E Ink has unveiled a new prototype foldable E Ink display at SID 2017. The display which you can see below in the video (which also shows many other E Ink demonstrations from SID) is 10.2" in size and features a 220 PPI - similar to E Ink existing flexible Mobius displays. You can see in the video that the display does not fold completely, there's still a gap - the bending radius is 7.5 mm.